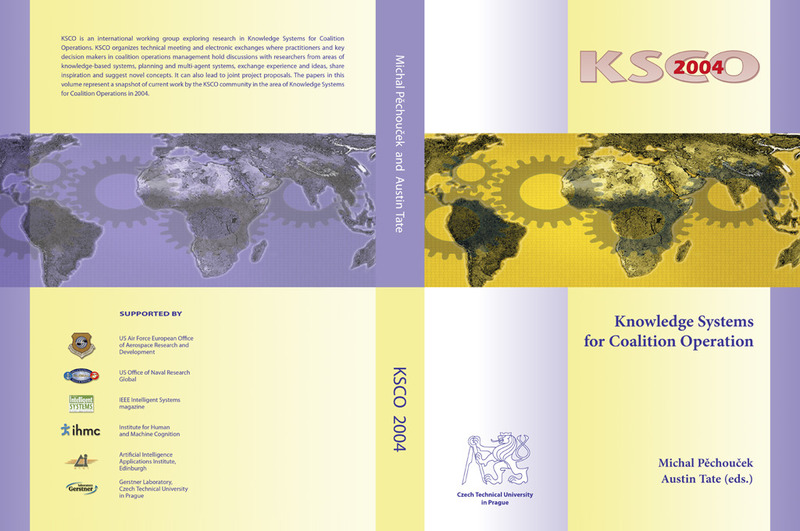 KSCO-2004 is a volume of papers by practitioners and key decision makers in coalition operation management together with researchers from areas of knowledge representation and reasoning, planning and multi-agent systems. The KSCO series of conferences and publications exists in order to exchange experience and ideas, share inspiration and suggest novel concepts. Originally, a workshop was planned to present these papers, but the meeting did not take place. The volume was published instead. An on-line copy of the KSCO 2004 book is available here (124MB PDF File). Pechoucek, M. and Tate, A. (eds.) (2004) Knowledge Systems for Coalition Operations 2004, Czech Tecnical University Press, Prague, Czech Republic, October 2004. ISBN 80-01-03065-2. The proposed conference at IHMC, Pensacola, Florida on 26-28 October 2004 was postponed. The original conference details are here. The editors would like to thank the European Office of Aerospace Research and Development (part of the Air Force Office of Aerospace and Development of the US Air Force) for their support under grant no. FA8655-04-M-5070 to allow for the production of this book. Special thanks goes to Jeff Bradshaw at IHMC for his work to investigate holding a KSCO meeting in 2004 and to Jan Tozicka and Dusan Pavlicek for preparing the typesetting and the cover of the volume. Except where otherwise stated, all papers are copyright © of their individual authors and are reproduced here with their permission. No unauthorised copying is permitted without written permission from the original copyright holders. All material in this volume not attributable to individual authors is copyright © 2004, AIAI, University of Edinburgh, Scotland and Gerstner Laboratory, Czech Technical University, Prague, Czech Republic.